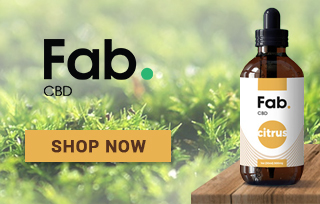 Fab CBD is a fairly new player on the CBD market, having only worked their way into the industry throughout 2018. I had actually never even heard of them before, but my wife ran into a friend not long ago who knew the owners, so when she came home and told me about them I decided to get online and order a couple of bottles. One thing I’ll say right off the bat is that I love the transparency and simplicity of the brand; they’ve got a great website, and currently only manufacture three products: CBD oil, topical CBD cream, and chewy CBD edibles. Personally, I always consider it a good sign when a CBD company prioritizes quality over quantity (in other words, I would much rather see only a few good products for sale, rather than dozens and dozens of mediocre quality products. And of course, I was pretty blown away by Fab CBD’s value in terms of price. Compared to most of the leading brands on the market (all of whom are pretty similar to one another with regard to price), they’re nearly 20% cheaper. 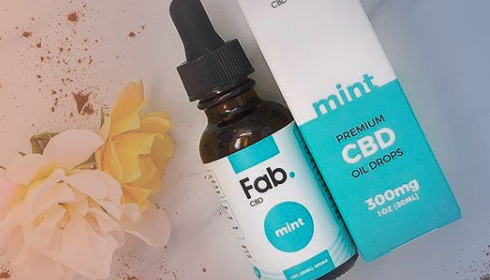 Fab CBD is actually located in Tampa, Florida, which is coincidentally the same area where two of my other favorite CBD brands are located: Green Roads and Hemp Bombs. (I’m not sure exactly why, but this area of Florida seems to be a hotbed for CBD manufacturers). The company itself appears to be pretty small, which is actually refreshing in the growing CBD market (where it seems a lot of the brands are just private labelers and subsidiaries of a much larger parent company). Like most CBD companies, however, the financial offices of Fab CBD are located in the United Kingdom. This always seemed a little questionable to me at first, but once I realized it was only because hemp operations have a hard time securing accounts with American banks, I learned to not worry too much about it (nearly every U.S. CBD company that we’re aware of banks with U.K. partners). Fab CBD certainly is not one of the most well-known brands out there (like I said I didn’t even know about them until my wife mentioned them to me), but I would be very surprised if they didn’t grow into a pretty successful long-term operation. Cost. To be honest, low costs are probably how Fab CBD is going to establish an initial reputation in the CBD industry – as of right now, they are nearly 20% less expensive than the industry average among the top brands (at least in terms of CBD oil; I didn’t compare their other products). Time will only tell if they can maintain these low prices once they become more established on the market. Simplicity. Like I’ve said many times before, I actually really like it when CBD companies only sell a small handful of products. 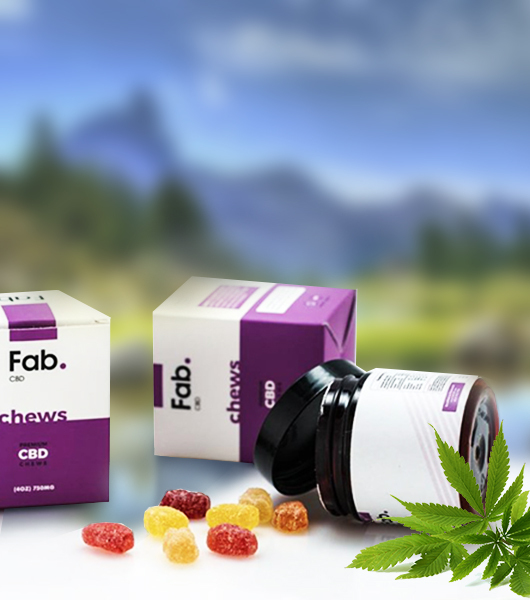 Currently, Fab CBD only offers a sublingual CBD oil, a topical CBD cream, and CBD gummy edibles. To me, this is a good sign that they put quality over quantity. Offer both full-spectrum CBD and CBD isolates. It’s always nice when a brand offers both full-spectrum CBD products and CBD isolates. For the unaware, full-spectrum oils are those that contain trace amounts of THC (less than 0.3%), while isolates are 100% THC-free. 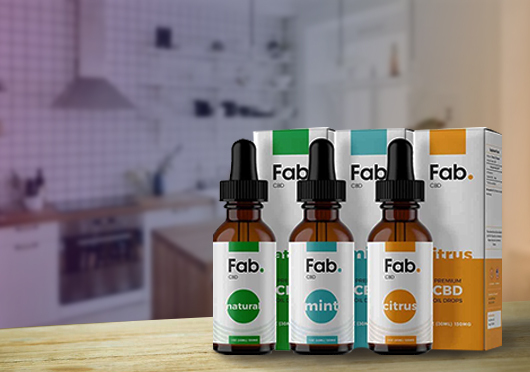 Fab CBD oral drops are full-spectrum, but their chewy CBD edibles are pure CBD isolate. Great transparency. I said it earlier in this review, but one of the first things that I really liked about Fab CBD was their website. They’ve got pictures of actual customers with their products, which is nice to see at a time when so much of the industry is afraid to show any kind of a personality. As long as they don’t “sell out,” I see Fab CBD doing great things in the market. Accessible lab reports. This was kind of surprising to me coming from such a small brand, but they actually use the same analytics lab (ProVerde) as some of the biggest names in the industry – including Pure Kana. Small operation. Again, it’s refreshing to find a small, locally-run operation amidst all the big money players and private labelers that are currently out there. Time will only tell whether they can make it on their own (a lot of small-time CBD companies get gobbled up pretty quickly by the competition), but I certainly am going to take advantage of their presence on the market while they’re here. As I’ve only tried the Fab CBD oil, I can’t comment too heavily on any of the other products. However, there were a couple things that kind of bugged me about the edible CBD chews. I was going to actually order some along with my CBD oil, but it didn’t even say (unless I completely skipped over it) how many chews total were in the bottle. Each bottle contains 750mg of CBD, but if you don’t know how many pieces are in there, you really don’t know exactly how much CBD you’re getting with each chew. Also, the long list of ingredients makes me wonder how good for me these might actually be, other than the (questionable) CBD dose. They are supposedly completely organic, vegan, and non-GMO however. Like I said I’ve only yet tried the Fab CBD Oil drops, and while they worked OK, I didn’t think they were quite as potent as the 600mg Pure Kana CBD oil that I take almost daily. However, the obvious difference is that Fab CBD is almost 20% cheaper. Is it worth the money that you’ll save? Well, that will entirely depend on you and your specific situation. For reference, I tried the 600mg CBD oil for $79. Pure Kana’s 600mg tincture, by comparison, is $95. Both come in 1 oz (30mL) bottles. While the Fab CBD drops had a definite effect on my pain, it was clear that they weren’t quite as potent as Pure Kana, nor did the effects last as long. Generally speaking I would say that Fab CBD would be a great option for those folks who want to try CBD oil for a relatively minor condition, and/or those who don’t want to spend an arm and a leg on the very top brands. Excellent value here for the money, but not the best stuff I’ve ever had in my life. Fab CBD Oil Drops: These are the standard sublingual CBD oil drops that I tried. They come in three different potencies (150mg, 300mg, and 600mg), with three different flavors (Citrus, Mint, and Natural Hemp) available for each. All bottles/potencies come in 1 oz (30mL) bottles. Fab CBD Muscle and Joint Topical Cream: The topical CBD cream is geared towards quick and directed relief for muscle and joint discomfort (as most all CBD topicals are) – it comes in a 2 oz tub and contains 600mg total CBD (pretty potent as far as topicals go). Fab CBD Chews/Edibles: The non-GMO, organic, vegan fruit-flavored chews come in a 4 oz jar, and supposedly contain 750 mg of CBD total. As I’ve mentioned though since it doesn’t say exactly how many chews are in each jar, you really don’t know exactly how much CBD you’re getting from each piece. Also, the long list of ingredients makes you wonder how healthy they are. They do come from CBD isolate though, and thus are claimed to be 100% THC-free. Like I mentioned earlier, I think Fab CBD would be an excellent option for people who are first trying CBD oil out for a relatively minor condition or ailment. I certainly can’t guarantee that you’ll see results on whatever it is you’re trying to treat, but at their current low costs, I can say that this is one of the better inexpensive CBD oils I’ve ever had. I’ll continue using my more potent stuff on a day-to-day basis, but I have no hesitation recommend these guys to people who are wanting to save a little money. Great value, friendly company, and I only hope to see them succeed and become more established on the nationwide CBD market. I use Fab CBD Muscle and Joint Topical Cream after a heavy workout and the results are great! Still in love with Fab’s Natural oil, it gives me a much-needed boost of confidence in the morning. At first I thought the CBD chews were a little expensive but considering how effective they were – I think I’ve changed my mind! CBD Chews are really good for working professionals like me. I can easily carry them to the office and comfortably have my daily dosage of CBD in a tasty way. The CBD chews are a refreshing way to have CBD, really enjoying the act of chewing! Cecilia from Dallas just bough! Frederick from Dallas just bough! Maci from Dallas just bough!